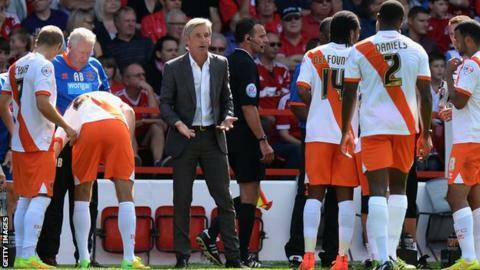 Blackpool manager Jose Riga revealed he only had nine players eligible on the morning of their Championship season opener against Nottingham Forest. Riga's side lost 27 players in the summer and had just eight professionals under contract two weeks ago. They signed 12 players in 12 days but were only able to name four substitutes for Saturday's game at the City Ground. "In the morning it was even worse, we only had nine players qualified," Riga said after Blackpool lost 2-0. "During the day we managed to get more. There were two 17-year-olds on the bench who were scholars." Blackpool reportedly failed to secure clearance for former Nottingham Forest striker Ishmael Miller, who signed for Blackpool on Wednesday, as well as Spanish defender Edu Oriol and Costa Rica midfielder Jose Miguel Cubero. "I was expecting to have more players than today," added Riga, who only took charge of Blackpool in June. "I try to do my job as manager and not solve administrative issues. For sure I cannot stay in this kind of situation a long time." Despite the disruption before the game, Riga was pleased with the efforts of his side. After Michail Antonio's calm sidefoot finish and Chris Burke's fine strike made it 2-0, Blackpool improved considerably but wasted a couple of half-chances to get themselves back into the game. "We had only played one friendly game and some players only arrived the day before so they have done well," he added. "It was a difficult situation so I am happy that the players have not had any physical problems after only playing once in pre-season. "The Championship is a tough league and I knew we could not be ready for today but I am hoping we can be ready soon and add more players." Blackpool have turned over more than £100m since their promotion to the Premier League in 2010, and last month club president Valeri Belokon criticised chairman Karl Oyston for failing to invest in the team.